Is Toxoplasma Making You Crazy? by Jean Hofve DVM • June 17, 2015 • Comments Off on Is Toxoplasma Making You Crazy? The amoebic parasite Toxoplasma does NOT cause mental and behavioral abnormalities in humans. Multiple studies have debunked this persistent myth. (Sugden K, Moffitt TE, Pinto L, Poulton R, Williams BS, & Caspi A (2016). Is Toxoplasma Gondii Infection Related to Brain and Behavior Impairments in Humans? Evidence from a Population-Representative Birth Cohort. PloS one, 11 (2). Click here to read the complete study. 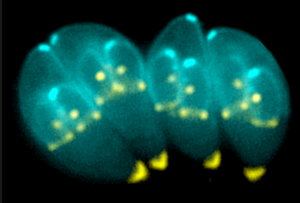 Toxoplasma gondii, a one-celled parasite similar to Giardia, has recently been making headlines as a possible cause of schizophrenia, bipolar disease, and other mental illnesses. But recent stories, like “Your Cat Could Be Affecting Your Mental Health“ from Yahoo! Health propogate unhelpful and misleading ideas about this parasite. Cats are the “definitive” host for Toxoplasma. That means that it can reproduce only in cats. However, all warm-blooded animals (mammals and birds) can harbor the parasite, and therein lies the problem. It’s certainly true that many Americans, possibly the 60 million estimated by Yahoo!, will test positive for the parasite. But this does not mean that so many people are infected. A positive test simply means that an individual has been exposed, and the immune system has made antibodies to the organism. It’s been estimated that about 23% of us have had such exposure, according to the Centers for Disease Control (CDC), but this varies by region, and numbers as high as 84% (France) have been reported. In most cases, people do not show any symptoms of infection. However, potential long-term effects, particularly those affecting the brain, are being debated. According to the Yahoo! article, “Researchers compared two studies that identified a link between owning a cat as a child and the development of schizophrenia in later life with the results of a 1982 questionnaire that found 50 percent of childhood cat owners were eventually diagnosed with a mental illness. Comparatively, 42 percent of people who didn’t have a cat as a child developed mental illness.” Wow, 50%, that’s a lot, right? Wait a sec, that’s a difference of only 8%… another case of lies, damn lies, and statistics! Cats, perhaps unfairly, get a lot of the blame for Toxoplasma infections in people. Cats contract the parasite by eating infected prey (such as rodents or birds), or from infected raw meat (particularly pork, lamb, and venison). A newly-infected cat will indeed shed infectious cysts in its feces for about 3 weeks — but only during that one period in its entire life. Less than 1% of Amercan cats are shedding infectious cysts at any one time, but many more have been exposed and have antibodies, which can persist for at least a year. The most common route of infection in people is by eating undercooked meat themselves (that same pork, lamb, and venison), or from gardening. To be fair, the reason gardening is such a hazardous activity is because outdoor cats’ feces are often deposited in garden soil. So if you love gardening like I do, wear gloves, and be sure to wash your hands… in other words, use common sense! Most of us are familiar with Toxoplasma as a threat to pregnant women, and indeed, if a woman becomes infected during her first trimester there is a significant risk of birth defects. It used to be that pediatricians recommended that women just “get rid of the cat” if she got pregnant, but that nonsensical recommendation is fortunately now limited to only the most ignorant and provincial doctors. As it turns out, the eggs shed by the cat in those critical three weeks don’t become infective for at least 24 hours, so the risk is minimal if litter is scooped daily. Assigning litter box duty to another family member is best, but again, common-sense precautions (mask, gloves, and thorough hand-washing if the woman must assume the duty herself) reduce the risk to virtually zero. Another option is for the pregnant woman to get a blood test herself. If she is already positive for Toxoplasma antibodies, she is immune and will not pass an infection on to her child. Infection in cats, while rare, can be serious, so if your cat shows these or other signs of illness, it’s always best to err on the side of caution and have your veterinarian check it out. Another dumb recommendation made by the Yahoo! article is to “keep the litter box covered.” Huh? What the heck difference does that make… other than to make the cat more likely to poop behind the sofa? The cysts will become infective in 24-48 hours regardless. Most cats prefer an uncovered box, and people are more likely to remember to scoop an uncovered box, so for pete’s sake, don’t go and cover the box! While we recommend keeping cats indoors (which mostly eliminates the risk of eating infected prey, other than stray critters who get into the house! ), we do recommend feeding raw meat, which can harbor cysts. Fortunately, it is fairly easy to make that meat safe: freeze it for -4oF for at least 72 hours. This ruptures Toxoplasma cyst membranes and destroys their infectivity. If you want to be extra-extra-certain, have your cat’s blood tested for Toxoplasma antibodies. If the cat is positive (which occurs within two to four weeks post-infection), the worst-case scenario is that her feces could contain infectious cysts for up to three weeks — and after that, all is well. If negative, then periodic testing will tell you if infection has occurred. As with most diseases, Toxoplasma prevention is mostly a matter of common sense and normal precautions. Keep your cat indoors, make sure meat has been frozen according to directions (most poultry, at least, has already spent some time in an industrial freezer before arriving at the store, but ask your butcher), wash your hands if you’ve been playing in the dirt, and always follow ordinary safe meat-handling procedures. And you won’t end up any nuttier than you started, even if you’re a crazy cat person like me!